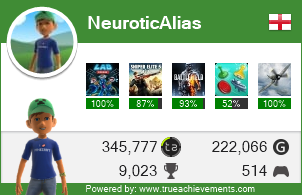 Got full completion on both the 360 and Xbox One versions, great game. Looking forward to the Donnie Yen movie too. 1000G on the glitchy mess that is Rush - A Disney Pixar Adventure (Xbox One). Didn't know there was a movie in the works. And Donnie Yen!? I'm in! Really enjoyed the Ip Man series. Seems there's a Part 4 of that on the way too! 1000G on Fe, decent little platformer but some of the collectibles are a pain, spent more time finishing them up than I did on the main story! My tommy has played this to death and surprised we haven’t 1000G it yet! Some of them just won’t unlock! 1000G on Midhight Deluxe. Nice little puzzle game. Easy 1000 score! Replaying a level after an achievement was supposed to unlock worked for me, sometimes had to replay them twice. 1000G on The Gardens Between. 1000G on QUBE2, currently free with Gold, very easy and no time trial achievements the first game. Been playing that myself. Enjoying it so far.